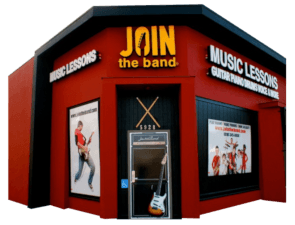 At Join the Band Music Lessons Studio in Sherman Oaks, we offer you a comprehensive studio comparison list of what makes our music lessons studio different. Longest running band and music lesson program in Los Angeles. Professional and practical learning environment. Music lessons in a variety of styles. Rock, Blues, Jazz, Country, Heavy Metal and more. A supportive environment that encourages team work. Special clinics with local pro musicians. Songs are all professionally charted to ensure your class runs more efficiently. Concert performances at popular local venues. Proven results for students preparing for school band and college programs.